For more than two decades, the concept of student engagement has grown from simple attention in class to a construct comprised of cognitive, emotional, and behavioral components that embody and further develop motivation for learning. Similarly, the goals of student engagement have evolved from dropout prevention to improved outcomes for lifelong learning. 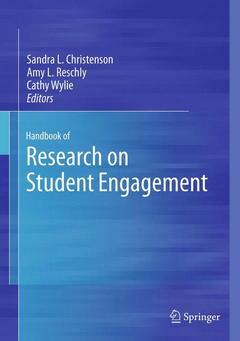 This robust expansion has led to numerous lines of research across disciplines and are brought together clearly and comprehensively in the Handbook of Research on Student Engagement. The Handbook guides readers through the field?s rich history, sorts out its component constructs, and identifies knowledge gaps to be filled by future research. Grounding data in real-world learning situations, contributors analyze indicators and facilitators of student engagement, link engagement to motivation, and gauge the impact of family, peers, and teachers on engagement in elementary and secondary grades. Findings on the effectiveness of classroom interventions are discussed in detail. And because assessing engagement is still a relatively new endeavor, chapters on measurement methods and issues round out this important resource. Self-efficacy in the engaged learner. Parental and social influences on engagement and achievement motivation. The engaging nature of teaching for competency development. The relationship between engagement and high-risk behavior in adolescents. Comparing methods for measuring student engagement. An essential guide to the expanding knowledge base, the Handbook of Research on Student Engagement serves as a valuable resource for researchers, scientist-practitioners, and graduate students in such varied fields as clinical child and school psychology, educational psychology, public health, teaching and teacher education, social work, and educational policy. Preface; S. L. Christenson, A. L. Reschly, and C. Wylie.- SECTION I: WHAT IS STUDENT ENGAGEMENT?.- Jingle, Jangle, and Conceptual Haziness: Evolution and Future Directions of the Engagement Construct; A. L. Reschly and S. L. Christenson.- Developmental Dynamics of Student Engagement, Coping, and Everyday Resilience; E. A. Skinner and J. R. Pitzer.- Engagement across Developmental Periods; D. Mahatmya, B. J. Lohman, J. L. Matjasko, and A. Feldman Farb.- Ethnicity and Student Engagement; G. E. Bingham and L. Okagaki.- Student Engagement: What is it? Why does it matter? ; J. D. Finn and K. Zimmer.- Section I Commentary: So What is Student Engagement Anyway: Commentary on Section I; J. Eccles and M. Wang.- SECTION II: ENGAGEMENT AS LINKED TO MOTIVATIONAL VARIABLES.- A Self-Determination Theory Perspective on Student Engagement; J. Reeve.- Achievement Goal Theory, Conceptualization of ability/Intelligence, and Classroom Climate; E. M. Anderman and H. Patrick.- School Identification; K. E. Voelkl.- Self-Efficacy as an Engaged Learner; D. H. Schunk and C. A. Mullen.- A Cyclical Self-Regulatory Account of Student Engagement: Theoretical Foundations and Applications; T. J. Cleary and B. J. Zimmerman.- Academic Emotions and Student Engagement; R. Pekrun and L. Linnenbrink-Garcia.- Students’ Interest and Engagement in Classroom Activities; M. Ainley.- Section II Commentary: Motivation and Engagement: Conceptual, Operational, and Empirical Clarity; A. Martin.- SECTION III: ENGAGEMENT AND CONTEXTUAL INFLUENCES.- Parental Influences on Achievement Motivation and Student Engagement; J. Bempechat and D. J. Shernoff.- Families as Facilitators of Student Engagement: Toward a Home-School Partnership Model; J. N. Raftery, W. S. Grolnick, and E. S. Flamm.- Teacher-Student Relationships and Engagement: Conceptualizing, Measuring, and Improving the Capacity of Classroom Interactions; R. C. Pianta, B. K. Hamre, and J. P. Allen.- The Role of Peer Relationships in Student Academic and Extracurricular Engagement; J. Juvonen, G. Espinoza, and C. Knifsend.- Understanding Student Engagement with a Contextual Model; S. Lam, B. P. H. Wong, H. Yang, Y. Liu.- Allowing Choice and Nurturing an Inner Compass: Educational Practices Supporting Students' Need for Autonomy; A. Assor.- The Engaging Nature of Teaching for Competency Development; R. Hipkins.- Assessment as a Context for Student Engagement; S. Nichols and H. Dawson.- Section III Commentary: Socio-Cultural Contexts, Social Competence, and Engagement at School; K. Wentzel.- SECTION IV: ENGAGEMENT AND STUDENT OUTCOMES.- The Relationship between Engagement and High School Dropout; R. W. Rumberger and S. Rotermund.- High School Reform and Student Engagement; M. H. Davis and J. M. McPartland.- The Power of Mindsets: Nurturing Engagement, Motivation, and Resilience in Students; R. Brooks, S. Brooks, and S. Goldstein.- The Relations of Adolescent Student Engagement with Troubling and High-Risk Behaviors; A. Griffiths, E. Lilles, M. Furlong, and J. Sidwha.- Trajectories and Patterns of Student Engagement: Evidence from a Longitudinal Study; C. Wylie and E. Hodgen.- Instructional Contexts for Engagement and Achievement in Reading; J. T. Guthrie, A. Wigfield, and W. You.- A Self-regulated Learning Perspective on Student Engagement; C. A. Wolters and D. J. Taylor.- Classroom Strategies to Enhance Academic Engaged Time; M. Gettinger and M. J. Walter.- Deep Engagement as a Complex System: Identity, Learning Power and Authentic Enquiry; R. Deakin Crick.- Section IV Commentary: Outcomes of Engagement and Engagement as an Outcome: Some consensus, divergences and unanswered questions; M. Janosz.- SECTION V: MEASUREMENT ISSUES, INSTRUMENTS, AND APPROACHES.- Measuring Student Engagement: The Development of a Scale for Formative Use; C. W. Darr.- Systems Consultation: Developing the Assessment-to-Intervention Link with the Student Engagement Instrument; J. J. Appleton.- Finding the Humanity in the Data: Understanding, Measuring & Strengthening Student Engagement; E. Yazzie-Mintz and K. McCormick.- The Measurement of Student Engagement: A Comparative Analysis of Various Methods and Student Self-Report Instruments; J. A. Fredricks and W. McColskey.- Issues and Methods in the Measurement of Student Engagement: Advancing the Construct through Statistical Modeling; J. Betts.- Section V Commentary: Possible New Directions in the Measurement of Student Engagement; K. Samuelsen.- Epilogue; S. L. Christenson, A. L. Reschly and C. Wylie. Sandra L. Christenson, Ph.D., is the Birkmaier Professor of Educational Leadership, Professor of Educational Psychology, and faculty member in the School Psychology Program at the University of Minnesota. Her research focuses on interventions that enhance engagement at school and with learning for marginalized students with and without disabilities. She is particularly interested in the identification of contextual factors that facilitate student engagement and increase the probability for student success in school, and the identification of the effect of family-school partnership variables. Amy L. Reschly, Ph.D., is an associate professor and training director in the School Psychology Program, Department of Educational Psychology & Instructional Technology, at the University of Georgia. Areas of expertise include engagement and dropout prevention; working with families and schools to promote student success; and, Curriculum-Based Measurement (CBM) and Problem-Solving. Cathy Wylie, Ph.D., is a Chief Researcher with the New Zealand Council for Educational Research. She has led the longitudinal Competent Learners project since 1993. Her research interests include the interaction between experiences and student development, and identifying policies that best support school capability to provide engaging and productive learning. Her research into policy includes the impact on schools and students of New Zealand national policies, including the shift to self-managed schools since 1989.